Since coming out of this funk, life has been much sweeter. And to try and help ensure that it stays that way I have been working on say yes this week. 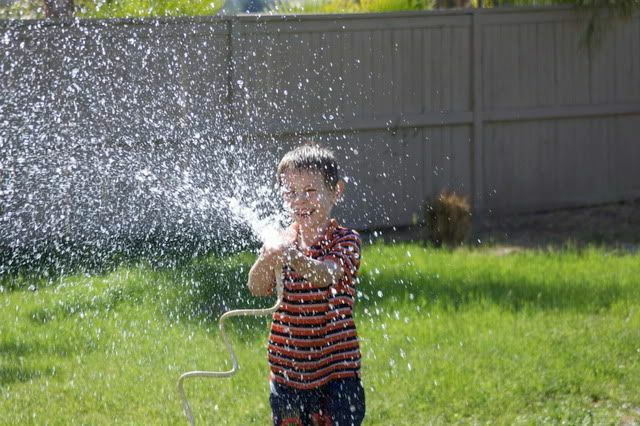 So when Lucas asked if they could play in the sprinklers... well I said yes. 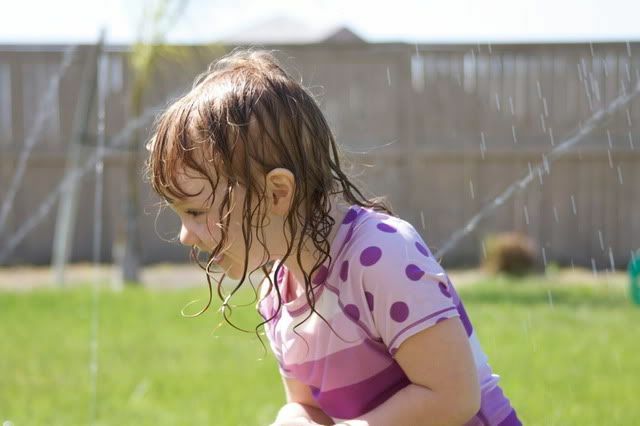 Sure I had to find them dry clothes..
That smile was definitely worth breaking out the sprinkler! Running through sprinklers makes me happy! I wish it was warm enough here to pull out ours! Looks like they had fun! Sometimes a mess is worth a yes! It was definitely worth it!!!! And what great memories they will have of their mother and childhood. You are such a great mother. P.S. Look at the curl in Alex's hair! So cute! I have to remind myself all the time to quit saying no and just say yes. yes, there will a mess to clean up and yes, it will take longer to clean up than the time it took them to enjoy it, but still, just say yes. They will only be this age once, then it's over. Other than the fact that I know you put these photos up to rub in my face that we're going to get snow tomorrow...I loved this. And my own bitterness aside over your lovely weather, this was a great thought. I agree, totally worth it! I agree! That smile definitely made it worth any mess! I struggle with remembering to say yes sometimes...but it's always worth it when I do! Darling pictures! 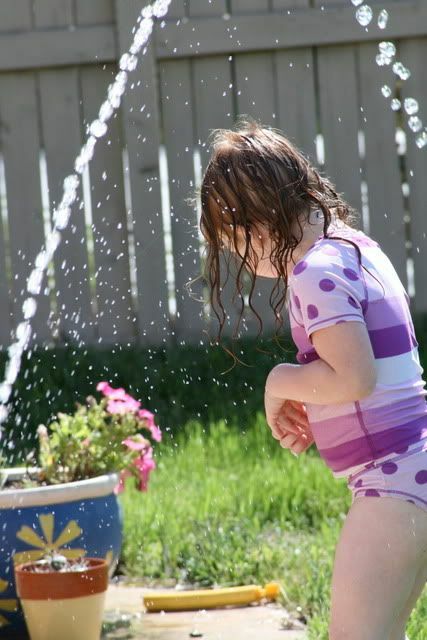 But it's still so cold here, I can't imagine doing sprinklers. Just looking at those pictures makes me cold! What fun they are having!! I think the best advice I was ever given as a mom was about saying yes. Every time you feel the need to say no..stop and ask yourself why no. More often than not I have no good reason..no can be a habit LOL! Wonder smart Mama you are hon!! For that smile??!!!! How could you not? Yep, it's puddles, used up towels, but those happy faces and squeals of delight are the best thing! I let my kids play in the water the other day too. Have a great mothers day!!! Wow - what great pictures. It must not be too cold where you are, because it is freezing here. It is good to say yes every so often ... especially when yes results in smiles like that! It was worth it to me just to see the pictures. Thank you for the sacrifice for my benefit! Such sweet photos. :) Glad you said yes. 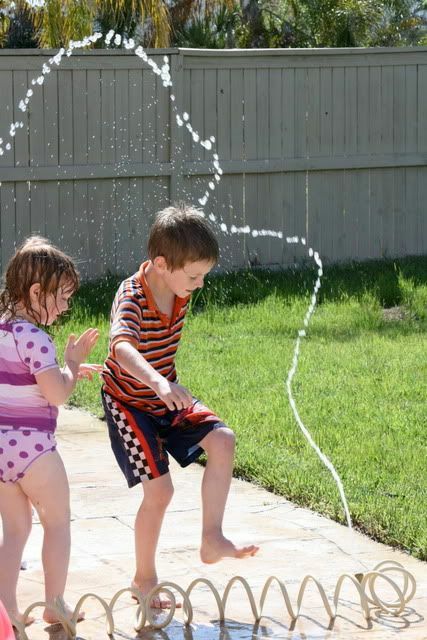 Looks like alot of fun with the sprinklers! Must say, I'm catching up on blogs...and loved your tribute to your mom. She looks like a pretty mom and a pretty terrific one, too. 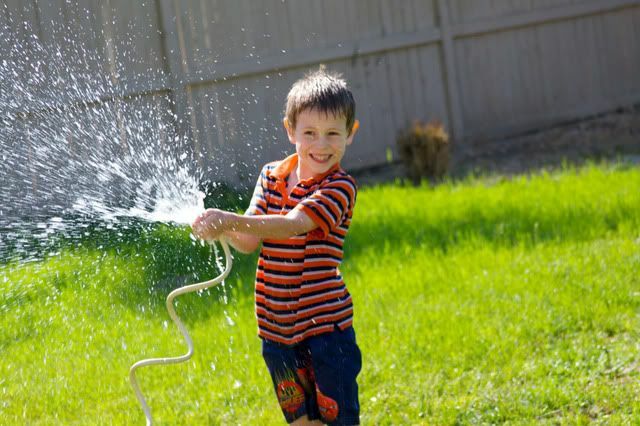 When I am in a mood or a funk, the best thing to get me out of it is to do something silly with the kids...let them paint, dig holes...sprinklers are too cold for us up here...but you get the picture...anything along those lines..just allow myself to be a kid again too. i'm working on "no" this week. Sometimes it's better to say yes and see the smiles! Way to go!